Coagulase-negative staphylococci (CNS) are considered to have a medium or low pathogenic capacity when compared to S. aureus. Among the more harmless, CNS are those that are used in the food industry, represented by S. carnosus, whose genome has extensively been studied. Its genome was found to contain several genomic sequences that have a virulent function in the pathogenic S. aureus. Even though these genes are probably not virulent in S. carnosus, their presence might indicate a more virulent potential. We report the third clinical case associated with a surgical-site infection with S. condimenti, which belongs to these food industry related CNS. It corresponds to a blood stream infection, secondary to a surgical-site infection. 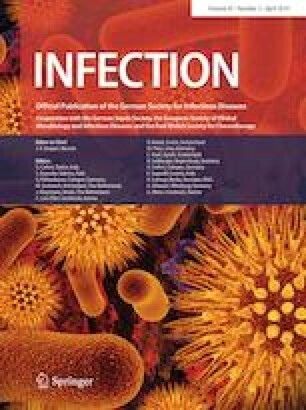 Antibiotic susceptibility testing indicated a resistance to erythromycin and rifampicin, which was partly confirmed by the presence of a macrolide resistance gene by PCR screening for S. aureus virulence factors. Although no other putative virulence factors were detected, this organism managed to cause a severe post-operative wound infection. This case shows that CNS that are currently used in the food industry may play a role in human infection. With technologies such as MALDI–TOF, pathogens that are regarded non-pathogenic could be identified more often. Therefore, the risk of different Staphylococcus strains used in the food industry must be better assessed. EUCAST. Breakpoint tables for interpretation of MICs and zone diameters. Version 7.1, 2017. http://www.eucast.org. Accessed 16 Mar 2017.